But why Uri is putting “Binyamin al-Assad and Bashar Netanyahu.” in the same Basket? Though at odds, Both threatens URI’s light calorie zionist project (Two state solution). Why Uri imagined posters condemning Bashar al-Assad? Because Syria is the last Arab fort. “Peace with the Palestinians is no longer a luxury. It is an absolute necessity. Peace now, peace quickly.’ Uri Avnery. .Now, URI AVNERY is stuck in Palestine, Abbas, the “plucked chicken” he saw at UN soaring into the sky has landed and Ismael Haneya is now souring into the sky, in cairo, Tunis, Turkey and Qatar. The low calorie zionist turned into polising MB, and reconciliation with his Islamic neighbors. “Moses was also heavy of the ears… when God told him to take his people to Canada, he took his people to Canaan, spending the prescribed 40 years – just long enough to reach Vancouver – wandering hither and thither in the Sinai desert.” he wrote. “If we want Israel to exist and flourish in a region that will for a long time be governed by democratically elected Islamist parties, we would do well to welcome them now as brothers, congratulate them on their victories and work for peace and conciliation with elected Islamists in Egypt and the other Arab states, including Palestine. We must certainly resist the temptation to push the Americans into supporting another military dictatorship in Egypt, Syria and elsewhere. Let’s choose the future, not the past.” he concluded. Unlike Moses, you are not heavy of the mouth and heavy of the tongue, you are heavy of the ears. It is not too late URI, cut your 64 years wandering hither and thither in the “Promised Land”, in three hours you may reach Germany your birth place. EVERYBODY KNOWS by now why we are stuck in Palestine. When God instructed Moses to plead with Pharaoh to let his people go, Moses told him that he was unfit for the job because “I am slow of speech and of a slow tongue” (Exodus 4:10). Actually, in the Hebrew original, Moses told God that he was “heavy of the mouth and heavy of the tongue”. He should have told Him that he was also heavy of the ears. So when God told him to take his people to Canada, he took his people to Canaan, spending the prescribed 40 years – just long enough to reach Vancouver – wandering hither and thither in the Sinai desert. So here we are, in Canaan, surrounded by Muslims. FOR DECADES, my friends and I have warned that if we dither in making peace, the nature of the conflict will change. I myself have written dozens of times that if our conflict is transformed from a national to a religious struggle, everything will change for the worse. The Zionist-Arab struggle started as a clash between two great national movements, which were born more or less at the same time as offshoots of the new European nationalism. Almost all the early Zionists were convinced atheists, inspired (and pushed out) by the European nationalist movements. They used religious symbols quite cynically – to mobilize the Jews and as a propaganda tool for the others. The Arab resistance to the Zionist settlement was basically secular and nationalist, too. It was a part of the rising wave of nationalism throughout the Arab world. True, the leader of the Palestinian resistance was Hadj Amin al-Husseini, Grand Mufti of Jerusalem, but he was both a national and a religious leader, using religious motives to reinforce the national ones. National leaders are supposed to be rational. They make war and they make peace. When it suits them, they compromise. They talk to each other. Religious conflicts are quite different. When God is inserted into the matter, everything becomes more extreme. God may be compassionate and loving, but His adherents are generally not. God and compromise don’t go well together. Especially not in the holy land of Canaan. THE RELIGIONALIZATION (if a Hebrew-speaking Israeli be allowed to coin an English word) of the Israeli-Palestinian conflict started on both sides. Years ago, the historian Karen Armstrong, a former nun, wrote a thought-provoking book (“The Battle for God”) about religious fundamentalism. She put her finger on an astonishing fact: Christian, Jewish and Islamic fundamentalist movements were very much alike. Delving into the history of fundamentalist movements in the US, Israel, Egypt and Iran, she discovered that they were born at the same time and underwent the same stages. Since there is very little similarity between the four countries and the four societies, not to mention the three religions, this is a remarkable fact. The inevitable conclusion is that there is something in the Zeitgeist of our time which encourages such ideas, something not anchored in the remote past, which is glorified by the fundamentalists, but in the present. 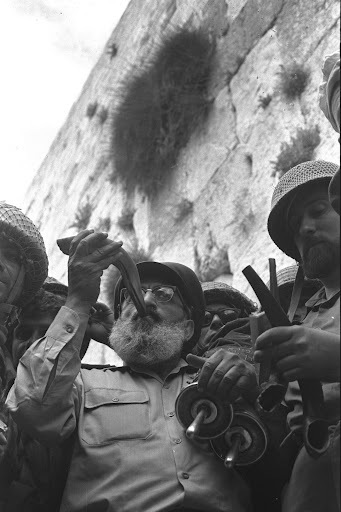 IN ISRAEL, it started on the morrow of the 1967 war, when the Army Chief Rabbi, Shlomo Goren, went to the newly “liberated” Western Wall and blew his Shofar (religious ram’s horn). Yeshayahu Leibowitz called him “the Clown with the shofar”, but throughout the country it evoked a resounding echo. 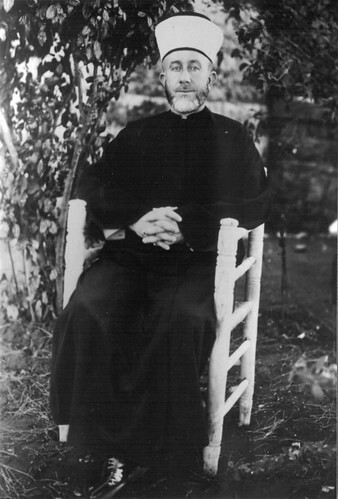 Before the Six Days, the religious wing of Zionism was the stepchild of the movement. For many of us, religion was a tolerated superstition, looked down upon, used by politicians for reasons of expediency. The overwhelming victory of the Israeli army in that war looked like divine intervention, and the religious youth sprang into life. It was like the fulfillment of Psalm 118 (22): “The stone which the builders refused is become the head stone of the corner.” The pent-up energies of the religious sector, nursed for years in their separate ultra-nationalist schools, burst out. The result was the settlers’ movement. 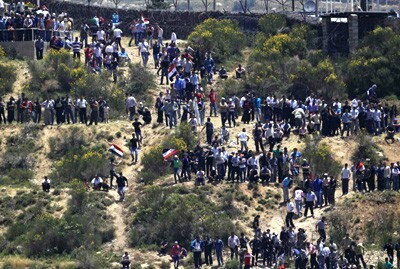 They raced to occupy every hilltop in the occupied territories. True, many settlers went there to build their dream villas on stolen Arab land and enjoy the ultimate “quality of life”. But at the core of the enterprise are the fundamentalist fanatics, who are ready to live harsh and dangerous lives, because (as the Crusaders used to shout) “God Wills It!”. The whole raison d’être of the settlements is to drive the Arabs out of the country and turn the whole land of Canaan into a Jewish state. In the meantime their shock troops carry out pogroms against their Arab “neighbors” and burn their mosques. These fundamentalists now have a huge influence on our government’s policy, and their impact is growing. For example: for months now, the country has been ablaze after the Supreme Court decreed that 5 (five!) houses in Bet El settlement must be demolished, because they were built on private Arab land. In a desperate effort to prevent riots, Binyamin Netanyahu has promised to build in their stead 850 (eight hundred and fifty!) 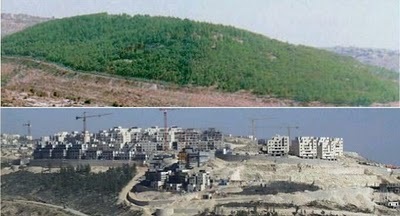 new houses in the occupied territories. Such things happen all the time. But let there be no mistake: after the cleansing of the country of non-Jews, the next step would be to turn Israel into a “halakha state” – a country governed by religious law, with the abolition of all democratically enacted secular laws that do not conform to the word of God and His rabbis. SUBSTITUTE THE word “shariah” for “halakha” – both mean religious law – and you have the dream of Muslim fundamentalists. Both laws, by the way, are remarkably similar. And both cover all spheres of life, individual and collective. Since the start of the Arab Spring, the fledgling Arab democracy has brought Muslim fundamentalists to the fore. Actually, that started even before, when Hamas (an offshoot of the Muslim Brotherhood) won the democratic, internationally monitored elections in Palestine. However, the resulting Palestinian government was destroyed by the Israeli leadership and its subservient US and European subcontractors. Last week’s apparent victory of the Muslim Brotherhood in the Egyptian presidential elections was a landmark. After similar victories in Tunisia and the events in Libya, Yemen and Syria, it is clear that Arab citizens everywhere favor the Muslim Brotherhood and similar parties. The Egyptian Muslim Brotherhood, founded in 1928, is an old established party which has earned much respect with its steadfastness in the face of recurrent persecution, torture, mass arrests and occasional executions. Its leaders are untainted by the prevalent corruption, and admired for their commitment to social work. The West is haunted by medieval ideas about the horrible Saracens. The Muslim Brotherhood inspires terror. It is conceived as a fearsome, murderous, secret sect, out to destroy Israel and the West. Of course, practically no one has taken the trouble to study the history of this movement in Egypt and elsewhere. Actually, it could not be further removed from this parody. The Brotherhood is first and foremost an Arab and Egyptian party, deeply embedded in Egyptian history. Though they would probably deny it, I would say – judging from their history – that they are more Arab and more Egyptian than fundamentalist. They certainly have never been fanatical. During their 84 years, they have seen many ups and downs. But mostly, their outstanding quality has been pragmatism, coupled with adherence to the principles of their religion. It is this pragmatism that also characterizes their behavior during the last year and a half, which – so its seems – caused quite a number of voters who are not particularly religious to prefer them to the secular candidate who is tainted by his connection with the corrupt and repressive former regime. This also determines their attitude towards Israel. Palestine is constantly on their mind – but that is true of all Egyptians. Their conscience is troubled by the feeling that at Camp David, Anwar Sadat betrayed the Palestinians. Or, worse, that the devious Jew, Menachem Begin, tricked Sadat into signing a document that did not say what Sadat thought it said. It is not the Brothers that caused the Egyptians who greeted us enthusiastically, the first Israelis to visit their country, to turn against us. Throughout the heated election campaigns – four in a year – the Brotherhood has not demanded the abrogation of the peace agreement with Israel. Their attitude seems to be as pragmatic as ever. ALL OUR neighbors are turning, slowly but surely, Islamic. That is not the end of the world. But it surely compels us, for the first time, to try to understand Islam and the Muslims. If we want Israel to exist and flourish in a region that will for a long time be governed by democratically elected Islamist parties, we would do well to welcome them now as brothers, congratulate them on their victories and work for peace and conciliation with elected Islamists in Egypt and the other Arab states, including Palestine. We must certainly resist the temptation to push the Americans into supporting another military dictatorship in Egypt, Syria and elsewhere. Let’s choose the future, not the past. Unless we prefer to pack up and head for Canada, after all.